A collaboration between Professor Julian Blow’s lab in Gene Regulation and Expression and the Drug Discovery Unit has provided insights into how differences between normal cells and cancer cells could provide a novel anti-cancer therapy. 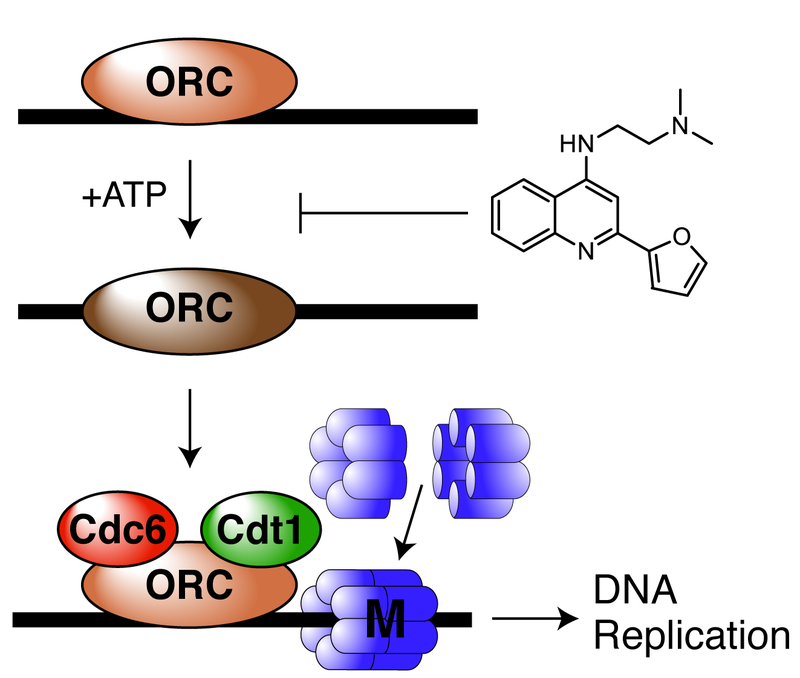 The work, which involved the identification of a new class of small molecules that inhibit DNA replication, has been published in Cell Chemical Biology. When a cell divides, there are multiple steps and safeguards to ensure that the information contained within that cell (the DNA) is copied faithfully into each of the two daughter cells that are produced. The different stages of this process form what is termed the cell division cycle. At the first stage of the cell division cycle, termed G1, minichromosome maintenance proteins Mcm2-7 are loaded onto the DNA in preparation for the next stage (termed S-phase), when DNA is replicated (copied). This process is called ‘replication licensing’. At the end of G1 the ‘licensing checkpoint’ is a critical safeguard that prevents progression into S phase until enough Mcm2-7 have been loaded onto DNA for replication to occur properly. In cancer cells, this checkpoint is lost so that cells can progression into S-phase with insufficient Mcm2-7 proteins attached to the DNA, meaning that DNA replication cannot be completed and the cancer cell cannot divide again. This work was supported with funding from Cancer Research UK, Wellcome Trust, SULSA and MRC-DPFS devolved portfolio.